The Lego® Farmer was born on 6 September 2014, and has since gone on to share photos of farming in Australia with the rest of the world! 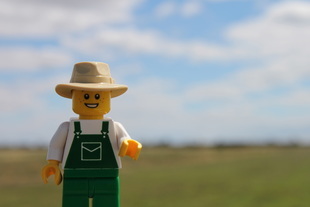 The Lego® Farmer is a minifigure created to represent farmers in Australia and around the world. His Lego® pieces are carefully chosen - a wide-brimmed, Akubra-style, hat representing all Australian farmers who work under our hot sun. Green overalls, whilst a stereo-type, are a worldwide recognised symbol of agriculture. And a smiling face, which eclipses the generous and welcoming attitude of farmers. Lego® was a chosen medium as it connects! Lego® has the ability to relate to everyone. Whether it be children of today who enjoy playing with Lego®, young adults who spent their own childhoods playing with Lego®, parents who can now share the joy of Lego with their own children, or grandparents who have watched Lego® transcend generations. The Lego® Farmer became Little Brick Pastoral on 1 January 2016 to continue sharing and celebrating Australian agriculture with the world! Photo by Tamara Cadd Photography. Aimee Snowden hails from an irrigation farm in the Southern Riverina, New South Wales, Australia. She has returned home to the family farm, after working in accounting and irrigation. 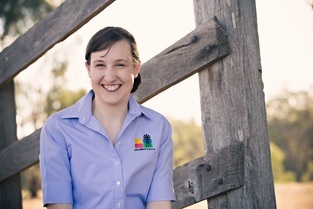 Aimee graduated with a Bachelor of Agricultural Business Management from Charles Sturt University (CSU) in 2016. 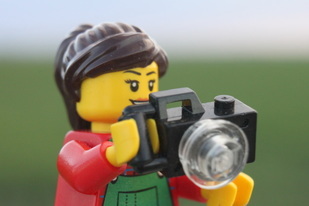 Aimee loves macro photography, all things agriculture, and is reliving her childhood playing with Lego®! Aimee is passionate about agriculture and excited about working in an industry that is diverse, full of creativity, technology and innovation! And an industry that feeds and clothes the world! !